These stunning halo stud earrings feature 2.27 carats Raspberry Garnet, surrounded by a halo of round white diamonds. Center: two cushion cut Garnet stones total 2.27 carats Diamond Halo: 56 round diamonds total 0.16 carats Set in 14k White Gold. Many of our items have matching companion pieces. Please view our other listings for more information, or let us know if you have a wish list item for us to fulfill! An insurance appraisal certificate (COA) will be included. The sample certificate photo on this listing is included only for illustration. 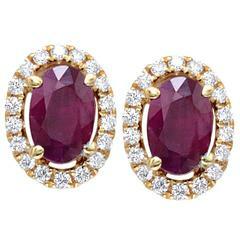 The oval ruby in these earrings have a total carat weight of 1.10 carats. 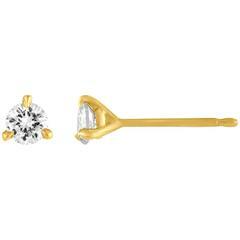 The diamonds have a total carat weight of 0.17 carats. Custom cut garnet kite stones wrapped in 18KT gold. Signature look by NYC jewelry designer, Page Sargisson. Last picture of model is to show the size of the earrings.